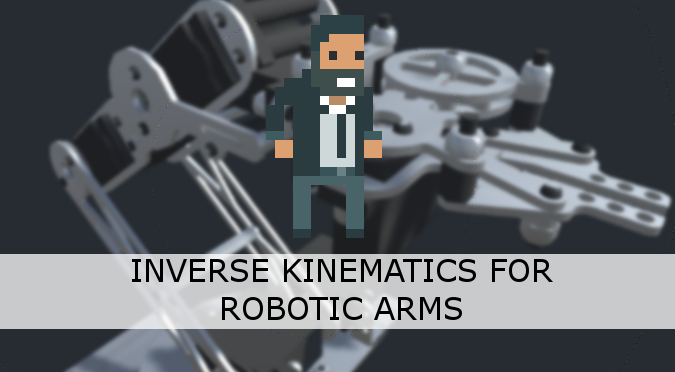 After a long journey about the Mathematics of Forward Kinematics and the geometrical details of gradient descent, we are ready to finally show a working implementation for the problem of inverse kinematics. This tutorial will show how it can be applied to a robotic arm, like the one in the image below. The previous tutorial, An Introduction to Gradient Descent, laid the mathematical foundations for a technique called gradient descent. What we have is a function, , which takes a parameter for each joint of our robotic arm. That parameter is the current angle of the joint. Given a particular configuration of joints, , the function return a single value indicates how far the effector of the robotic arm is from the target point . Our objective is to find the values for that minimise . To do so, we first calculate the gradient of a function for the current . The gradient is a vector that indicates the direction of the steepest ascent. To put it simple, it’s an arrow that tells us the direction in which the function grows. Each element of our gradient is an estimation of the partial derivative of . and , and are sufficiently small values. where is the learning rate, a positive parameter that controls how fast we move away from the ascending gradient. When invoked, this function returns a single number that indicates how the distance from our target changes as a function of the joint rotation. What we have to do is to loop over all the joints, calculating its contribution to the gradient. Invoking InverseKinematics repeatedly move the robotic arm closer to the target point. One of the main problems of inverse kinematics made with such a naive implementation of gradient descent is that it is unlikely to converge. Depending on the values you have chosen for LearningRate and SamplingDistance, it is likely your robotic arm will “wiggle” around the actual solution. If we repeat this check after each joint rotation, we ensure that we perform the minimum amount of movements required. To further improve the performance of our arm, we can apply gradient descent in reverse order. Starting from the end of the arm, instead of its base, allows us to make the smaller movements. Overall, these little tricks allow to converge to a more natural solution. Even with angle constraints and early termination, the algorithm that we have used is very simple. Too simple. There are many issue that you might encounter with this solution, most of them related with gradient descent. As described in An Introduction to Gradient Descent, the algorithm can get stuck in local minima. They represent suboptimal solutions: ways to approach the target that are unnatural or undesirable. The robotic arm has gone too far, and now that has returned back to its original position, is twisted. A better approach to avoid this is to add a comfort function. If we have reached destination, we should try to re-orient the robotic arm to a more comfortable, natural position. It should be noted that this might not always be possible. Re-orient a robotic arm might force the algorithm to increase the distance from the target, which might be against the specification. How to speed up robot-arm movement to maximum speed? There is no concept of “maximum speed” in IK. The “speed” is mostly determined by how many iterations it takes to find a solution to the IK problem. If you need an arbitrary speed, then you need to change the way this works. A good solution is to calculate the “final” point in a single Update call. Then, when you have it, you can lerp as fast as you want to the target. This solution will work regardless of the language you are using. So yes, it will work on an Arduino as well. The only problem, however, is that Arduino doesn’t use C#, so you’ll have to adjust the code accordingly. The hardest bit might be the Maths. Unity comes with a lot of libraries to rotate points in 3D space. Arduino doesn’t have that, so you’ll have to write those equations yourself. I have a tutorial on that as well, hopefully it can help ( https://www.alanzucconi.com/2016/02/03/2d-rotations/ ). I’m not sure what you mean exactly with your second question. Loving the tutorials, been a huge help in some projects of mine. It seems that that part 7 (spider legs) is missing and brings me to an error page. Has it not been finished yet? Awesome job on the tuts, thanks! I have most of the stuff ready, so hopefully it will be released soon! I’m wondering that myself. Although he says: “The name is self-explanatory: angles[i] contains the local rotation for the i-th joint. “, this tells us nothing about which angle of the joint we’re talking about, and on which axis. Angles is an array that, as Micheal highlighted, contains the local rotation for each joint. The inverse kinematics algorithm requires to “explore” how a certain rotation would affect the position of the end effector. You can’t really move the actual robotic arm to test this. So the angles of the joints are copies into this array, and the algorithm changes it until it finds a solution. In this specific solution, each joint can only rotate on a single axis. So there is *no* ambiguity. If this is for a 2D game, it will most likely be the Z axis. The full project is also available on Patreon if you need! Oh, okay, so it’s a single axis, and the axis depends on where you want to go. Oddly enough though when I aim the tip of my arm to (0,2,0) and use the x axis of the two joints, it doesn’t go anywhere near the target (Arm starts on the floor), Somehow it reaches down. Maybe calling InverseKinematics from the Update() loop with the target vector isn’t right? I’m trying to figure this out at least a little on my own before I download the project and cheat by just blindly using that. but then, how would we re-apply it to Joints[i].transform.rotation? We can’t just plug the float value of angles[i] into the quaternion. In that particular implementation, each joint only moves along one axis (X, Y or Z). You can simply change the localEulerAngle to update the rotation of a joint. Thank you, great tutorial series. Just a question, would it be easier to implement this solution using FABRIK? I am not familiar with FABRIK, so, unfortunately, I can’t really advise you on that. I know how to use CCD very well, and I am planning on having a tutorial on that relatively soon. Okay, sorry about the pushiness here, but I see that it’s impossible to download the project without paying $25 on Patreon. In order to consider that I would need to see the final tutorial part with the spider legs completed, and maybe a part thrown in about robot legs, if it isn’t obvious enough from the spider legs part when that’s complete. In order for this to be really worth my time/money, I need to be able to use it to procedurally move procedurally generated robots around a room. (I am making a Berzerk clone in 3D). Yes, the technique can be implemented in any language. Well like I said trying to do a Robotic arm like the JEMRMS. But calculating the vectors to move the joints is what I haven’t figured out yet?